Patient Speculation: He Examined The Market And We Cashed In! He Examined The Market And We Cashed In! Anyone who has been following my Portfolio Lite will know that I am also in the process of building a small portfolio of subscription based services called my benchmark portfolio to measure my portfolio lite to in terms of results. The first addition to the benchmark portfolio was The Market Examiner who I started following from the start of this month. 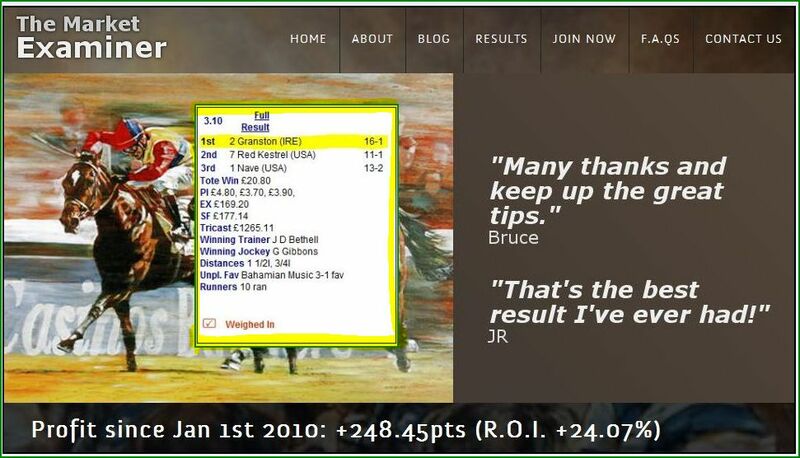 The results in the two weeks that I have been following the service using my twist on an eachway staking plan have been negative which I was not concerned about at all because I know that the average odds The Market Examiner backs at are quite high and loosing runs are to be expected. What I did not expect so soon though was the fantastic result today. I know one result does not really prove anything but I have been following the service for a few years now and this is not an isolated occurrence. The point I want my blogs readers to take from this post is that it is vital to have a long term view when following a tipster or trying a method that you have done your research on, because it is inevitable that we will have losing runs but as long as the wins when they arrive exceed the losses we have nothing to worry about. Never a truer word said. Great to see The Market Examiner find a great winner. Portfolio Lite is a great addition to Patient Speculation and I can see it going from strength to strength. It is a very exciting project. The portfolio lite and now my benchmark portfolio have both got off to great starts. As you say it is a very exciting project. Great stuff with all the services and well done to The Market Examiner who is having a cracking 2011. I wanted to ask you something after going back through some data of my own. How did you decide to focus on the each way side of things with your selections and not simply win only? Is it just as a cushion against the longer losing runs? Or something else. Asking mainly as I had a couple of optimum bets today at 12/1 and 20/1 both second and I'm getting a bit frustrated. I know going more points on the win would produce a bigger profit then each way but I'd just feel more secure getting some kind of return. With regards to my decision to back eachway. With my own selections generally the majority of the value is in the place part of the bet so that is why I bet eachway. 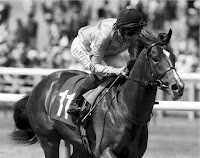 With regards to the majority of horse races it is generally accepted that betting win only is the bet that contains the most value, the problem is as you say it can be very difficult to deal with the long losing runs and so some people trade some of the win value for shorter losing runs by backing eachway. The calculator that I have designed and am using now basically allows me to back eachway and then lay a part of the place part of the bet back on betfair so as to result in the following. If the selection is unplaced I lose both parts of the eachway bet but win the place lay bet so as to limit my losses. If the selection places I will not win or lose anything. If the selection wins I will win the win part of the bet plus a portion of the place winnings equivalent to the win bet stake. (ie with a selection at 16/1 I will get the equivalent of 17/1 on the win part of the bet. If you send me your email address via a private message on twitter with the version of excel that you use I will send you a copy to play around with. I do intend to give the calculator away on the blog but I am bogged down at the moment trying to write legible instructions. i take the point about the long term view but dont totally agree with it. did jp not take a long term view? how long is a long term view ?? till your dieing day?? isent the current form of a service the most important not the past ?? Thanks for your comment and I appreciate you spelling out that you are not having a go. My answer to your point would be that we all have our own ideas about how we approach our betting. I believe that all services or methods will have periods where they suffer quite considerable drawdowns, it is just part of the game we play. The $64,000 dollar question is how do we deal with these times of poor performance. To me we can manage it with our staking, by that I mean we put the equivalent to a stop loss into place. I for example have a simple rule that if my bank for a particular service or method halves, then I will halve my stakes. I know it sounds simplistic but it is a clear safety net. Also making sure that no one service is dominating your results by making sure that your bank sizes for each service or method are set so as to limit your liabilities if any one bank has a poor period of performance can help. What I am trying to say is that it is up to all of us as individuals to look at our aversion to risk and set our staking accordingly. kodagira seems to be cracking up , big sbc poster ect , following the best recommended services but at present he seems a stones throw from packing it in . he might have done it all ready because i doubt he had a good day today.